The Medicine Buddha represents an extremely powerful form of enlightened energy. 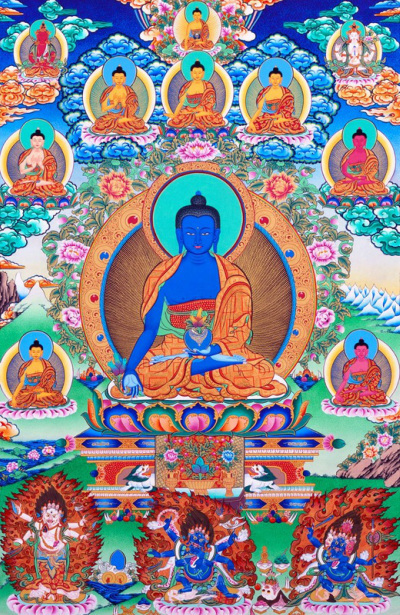 The practices of Medicine Buddha are efficacious in healing and helping one to accomplish one’s goals successfully and can be of benefit to someone who is ill or who has died. It is very important that the elaborate Medicine Buddha puja be done regularly in order to benefit all. Medicine Buddha puja is also something that can be done for people who are dying, or who have already passed away, and also for individual success in all kinds of activities. This Medicine Buddha practice is extremely powerful and beneficial especially when it is done with extensive offerings beautifully arranged. Everybody is welcome to attend! This is a free event. Donations are appreciated.